THE PEACH BUZZ: We Love Our Elders! 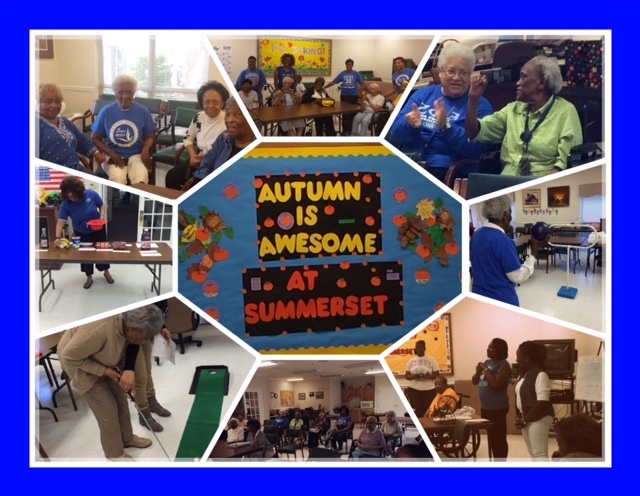 The “Outstanding” Omicron Kappa Zeta chapter is proud to serve Summerset Assisted Living Community located on Benjamin E. Mays Drive in Atlanta, Georgia. We have consistently hosted various activities for the past two years for these amazing residents that would warm anyone’s heart. We keep the residents engaged with activities and events to enhance mobility, increase socialization, promote healthy living, and that administer the greatest medicine of all…laughter! Some examples of these events are: Sit and Be Fit, Nutritious Nibbles, Movie Day, Spa Hour, March Madness Indoor Sports, Holiday Card Decorating, Scrapbooking, and Karaoke. These events have not only attracted residents in the facility and their families, but outside community patrons as well. Omicron Kappa Zeta has welcomed Girl Scout representatives from Troop 507, educators from Atlanta Public Schools and students from Rockdale County to assist with the residents at this well-established living community. We enjoy the time that we get to spend with our seniors. We feel it is therapeutic for all parties involved. We will continue our efforts as long as there is a need in the community.